Recent years have seen a resurgence in silent films accompanied by live musicans. FW Murnau’s 1922 Nosferatu will be presented at the Strand Theatre in downtown Vicksburg with live original music by Palmer Shiers and Jeff Gough, known collectively as Moving Machines. This year they are being joined by percussionist Josh Harrison. Anyone who attended last year’s presentation of The Cabinet of Dr. Caligari knows how cool this will be. It was standing room only last year, so getting advance tickets and/or getting there early is a good idea. adding his unique percussion treatments to their sound. Roger Ebert gave Nosferatu 4 out of 4 stars. Here are a few of his comments about the film: Murnau's silent film was based on the Bram Stoker novel, but the title and character names were changed because Stoker's widow charged, not unreasonably, that her husband's estate was being ripped off. Ironically, in the long run Murnau was the making of Stoker, because “Nosferatu” inspired dozens of other Dracula films, none of them as artistic or unforgettable. 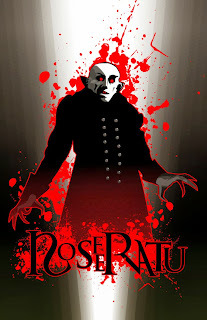 “Nosferatu” is more effective for being silent. It is commonplace to say that silent films are more “dreamlike,” but what does that mean? In “Nosferatu,” it means that the characters are confronted with alarming images and denied the freedom to talk them away. There is no repartee in nightmares. Human speech dissipates the shadows and makes a room seem normal. Those things that live only at night do not need to talk, for their victims are asleep, waiting.